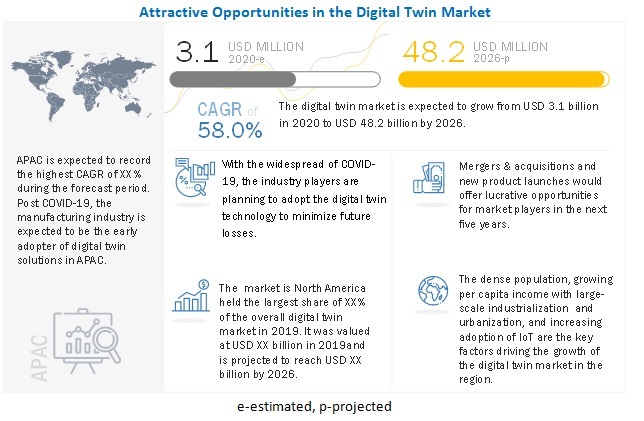 [137 Pages Report] The digital twin market was valued at USD 1.82 Billion in 2016 and is expected to reach USD 15.66 Billion by 2023, at a CAGR of 37.87% during the forecast period. The base year considered for the study is 2016, and the forecast for the market size is provided for the period between 2017 and 2023. The research methodology used to estimate and forecast the digital twin market includes the use of extensive primary research and secondary research. The secondary sources referred for this study includes directories; databases such as Hoovers, Bloomberg BusinessWeek, Factiva, and OneSource; and associations. The vendor offerings have been taken into consideration to determine the market segmentation. The top-down procedure has been employed to arrive at the overall market size of the global digital twin market. After arriving at the overall market size, the total market has been split into several segments and subsegments, which have been verified through primary research by conducting extensive interviews with key officials from the companies operating in the digital twin ecosystem, such as CEOs, VPs, directors, and executives. This data triangulation and market breakdown procedures have been employed to complete the overall market engineering process and arrive at the exact statistics for all segments and subsegments. This report provides valuable insights into the digital twin market such as IoT vendors, proprietary software related to the digital twin, and end-user industry segments. General Electric (US), IBM Corporation (US), Microsoft Corporation (US), Oracle Corporation (US), and PTC, Inc. (US), ANSYS, Inc. (US), Dassault Systèmes(France), Siemens AG (Germany), and Robert Bosch GmbH (Germany) are the digital twin products and service providers. In this report, the global market has been segmented on the basis of end user and geography. The digital twin market is expected to be valued at USD 15.66 Billion by 2023, at a CAGR of 37.87% during the forecast period. Developments and launches of new products in the market cater to the high growth of this market globally. The digital twin technology has applications in product design and development, machine and equipment health monitoring, predictive maintenance, and dynamic optimization. The digital twin technology is used to generate the virtual models outside of engineering environments involving the applications such as product design and development, and production. 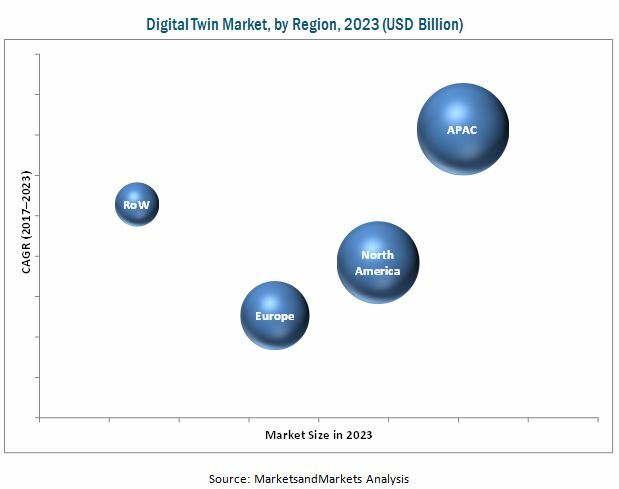 The digital twin market based on end user has been segmented into aerospace and defense, automotive and transportation, energy and utilities, home and commercial, electronics and electrical/machine manufacturing, healthcare, and retail and consumer goods, and others. The other industries include materials and chemicals and agriculture. The rising need for digitalization in agriculture, and chemicals & materials industries is one of the major factors contributing to the growth of digital twin market in this region. Moreover, the presence of few major IoT vendors such as IBM Corporation (US), Microsoft Corporation (US), Oracle Corporation (US), and PTC, Inc. (US) have started offering products and solutions that help create the digital twins that form a core part of the digital transformation of many industries. The digital twin market in APAC is expected to grow at the highest CAGR during the forecast period, followed by the market in RoW. The growth of the market in APAC is attributed to the increase in development of various industries that has led to growth in the adoption of digital twin systems for digitalization of various end user industries present in developing countries such as India, Japan, and China. Increasing occurrences of viruses and cyber-attacks lead to many security concerns. Important information can be stolen by malicious viruses in computer systems, causing a major loss to the industries. Hence the risk associated with the data security is one of the restraining factors for the growth of the digital twin market. Key players in this market focus on the product developments and launches, strategic partnerships, collaborations and acquisitions to increase their revenue. For instance, in November 2016, GE launched the Predix system software architecture and services designed to make any machine an intelligent asset, and to bring visibility, control, and analytic insights to industrial infrastructure and operations. The platform is compatible with a variety operating systems, devices, and form factors. This new software would also focus on expanding the platform and development of digital twins.